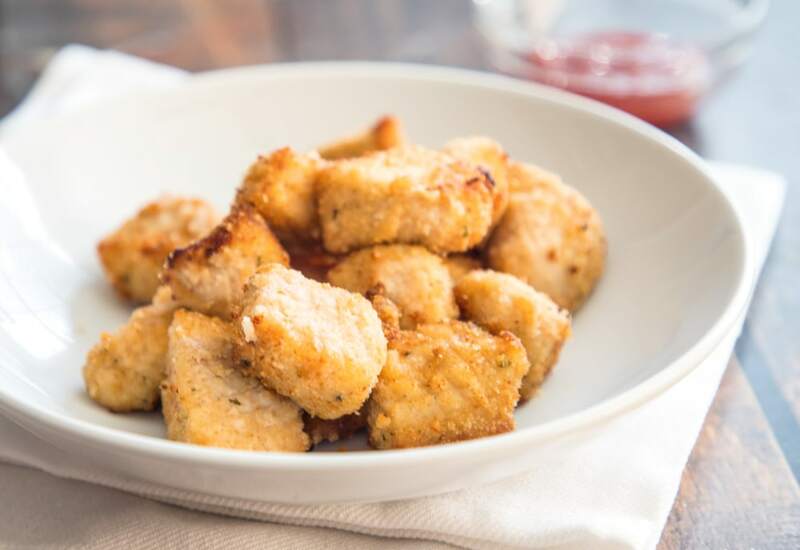 Homemade chicken nuggets are super simple to make, especially when you have an air fryer. Simply season small pieces of chicken with salt, pepper, and seasoned salt, coat in a little bit of oil and bread crumbs, and cook in the air fryer for only 8 minutes! You will soon be having happy hour and game day parties at your house all the time because of these chicken nuggets. Serve with your favorite dipping sauces! Need some ideas? How about mixing sriracha and mayonnaise (or Greek yogurt) for a spicy kick. Tzatziki sauce is a nice and cool dipper. Mix honey and mustard together for a honey mustard dip. The options are endless. Per Serving: 274 calories; 8g fat; 10.3g carbohydrates; 38g protein; 99mg cholesterol; 461mg sodium. My kids devoured this! I'm not a huge fan of using salt so I skipped the seasoned salt. I also made a ketchup and mayo sauce mix for dipping. The parmesan cheese added was the perfect secret ingredient, but you can omit it or use a vegan cheese substitute if you're dairy free. I like the mix of plain and Panko bread crumbs. I've tried making nuggets before with just Panko and I didn't like it as much. This is a great recipe, especially for small kids and picky eaters. Dipping sauce optional, my kids didn't even ask for any which is a good sign.